As many other people often are, I was skeptical (big shock, right?) about the usefulness of trekking poles before I bought some. I would see many hiking snobs using them, presumably because they thought they looked cool, or whatever. That was before I got them. Read on, o' skeptic, for thou knowest not what these babies can do. Seem to save a lot of effort on the way up, not so much on the way down. Now before I get too far into this, let me just tell you that trekking poles serve a very basic function: to reduce fatigue. Oh sure, you can use them as an emergency splint in case you tear your leg off. Or they can even double as a tent pole in a pinch, but their designated purpose is to take weight off your lower body, thus helping you walk longer, farther, faster. 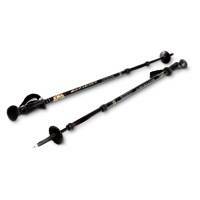 I first used the EMS Alpine Tour poles on our hike up Mt. Washington - the Peak Hike (click for the trip report). As a leader on that hike, I was responsible for other people, so fatigue was not allowed. If there was a problem, I couldn't just say, "O Jeez, I'm too tired to help!" So, once I left the Pinkham Center, I grabbed my poles, locked the shock absorbing springs, and headed out with my group. I first noticed the comfortable grip, but wondered if my soggy hands would lose purchase. I discarded the thought figuring I'd burn that bridge when I came to it. Immediately, I was cooking along at a decent pace, passing other groups that had left before me. Before I realized it, I had arrived at the Hermit Lake hut without a break. What was going on here? I NEVER make it that far before a break! These high-priced sticks actually worked! I was amazed. As I continued on, I took notice of the poles' features. The carbide tips grabbed everything I put them down on, from moss to solid granite. I liked the three sectioned design, as it allowed me to change the pole length quickly. One nice feature is a series of numbers painted on the shaft that let you know to what length you are adjusting each pole (having them different lengths is annoying). Wrist straps are also integrated into the grips, I assume to keep you from dropping them off a cliff and impaling someone. Without getting too excited about the whole thing, let me narrow this down. These poles work. They reduce fatigue as designed, they don't bend or slip easily, and they are fully adjustable. On the negative side, the shock absorption didn't seem to do much for me. On the return trip the poles didn't seem to offer much by way of impact protection (my knees still hurt when we finished). Great for Snowshoeing, too. EMS Alpinist positive-angle rubber grip is designed for comfort and positive pole placement. Shaft is made from lightweight aluminum. Three-section dual-component construction provides insulation, comfort, durability. Spring-loaded anti-shock system turns off for use in rigid mode. Works at all temperatures. Also features trekking baskets, convenient twist-lock adjustments, and adjustable wrist loop. A solid buy. The EMS Alpine Tour fits the bill perfectly for ascending or flat walking, reducing strain, load, and shock to the lower body. On the downside, the shock absorption feature doesn't seem to do much, and it raises the price significantly. As one of the cheaper alternatives on the market, I'd buy these again. Other poles by Leki or Komperdell perform exactly the same function for more money. NOTE: EMS doesn't seem to sell these poles under this name any longer. Try the Guide 99 poles, they seem to be a close match.